INTI International University is leading the empowerment of students through international exposure through an academic partnership with IBM, promoting innovative learning and individual development. INTI recently hosted a forum featuring six international IBM executives who were part of IBM’s Corporate Service Corps. This was one of many collaborative efforts by INTI and IBM that includes projects, exhibitions, on-campus interviews, workshops, career coaching and mentorship sessions to help students excel in their future careers. 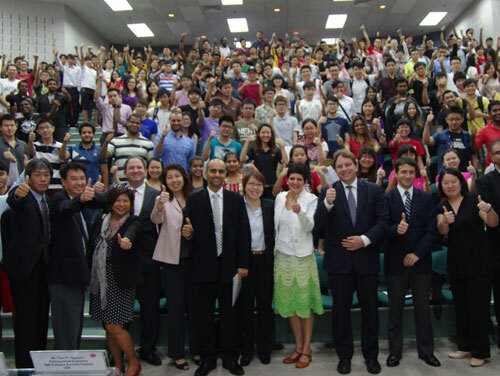 IBM experts pose with students and faculty at INTI International University. The visit by IBM experts was part of IBM’s community service efforts, after the 2013 IBM Smarter Cities Challenge Grant was awarded to the state of Negeri Sembilan, where the university is located. The IBM Team had an opportunity to explain IBM’s Smarter Cities Challenge Grant and provide some insight into how they believed they could contribute to plans to make Negeri Sembilan an even better place to live and work in. Following the hour and a half long forum which was witnessed by more than 280 students, mentorship and coaching was provided by the team of six experts for 40 final year students to give them an edge in their transition to the workplace. The Smarter Cities Challenge is IBM’s single-largest philanthropic initiative, with contributions valued at over US$50 million to date which contributes the skills and expertise of its top talent to address critical challenges facing cities around the world. Teams on the ground work closely with city leaders for three weeks and deliver recommendations on how to make the city smarter and more effective. 100 cities have been selected to receive grants. “It is important to prepare students for employment and to ensure their knowledge and skills are current and relevant to industry needs. At INTI, we continuously focus on engaging industry in our talent development initiatives and our students are exposed to the needs and demands of the industry at different levels of their academic journey,” said Christine Wong, INTI International University’s Head for Employer and Alumni Relations. The opportunity to be inspired by accomplished thought leaders on a regular basis is a privilege accorded to few students outside of INTI. At INTI, students also have access to captains of industry via the Business Leadership Series which has seen prominent corporate leaders speaking to INTI students on the latest trends and developments in business and career opportunities on a global scale. “INTI’s programmes are developed and constantly refined to meet the requirements of employers and the industry. Our strong links with industry partners have enabled our students to keep in constant touch with their potential employers, through visits to their work places, workshops, internships, and important projects that provide students with real world work experience,” said Wong. Innovation brings multiple industry projects that enable INTI’s students to work with employers on real business issues and solutions to gain experience and readiness for global employability. INTI’s students have undertaken 180 innovative projects with 98 employers from various industries since 2011. Real employer projects have been introduced in the classroom to help students develop problem solving, collaboration, communication and critical thinking skills. For more information on INTI’s career-focused programmes, call 06-7982000 / 03-56232800 / 03-2052 2888 / 04-6310138.